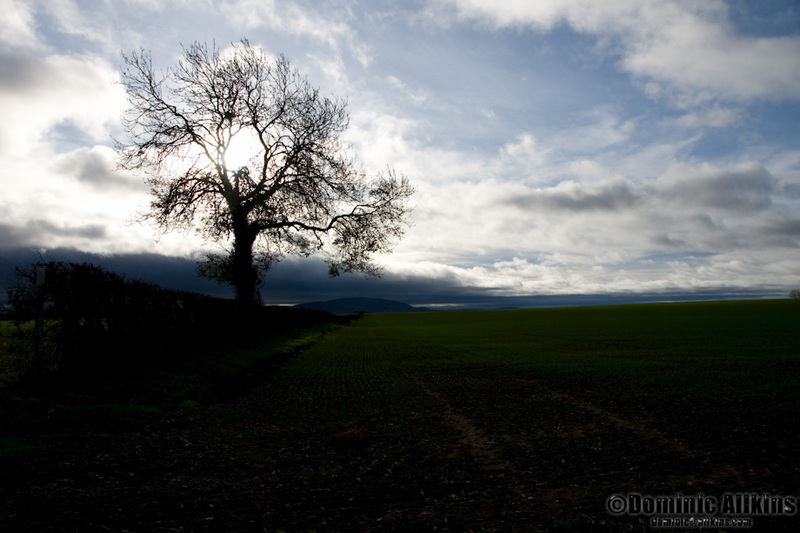 Earlier in the week I posted the picture below of a Shropshire landscape. Landscapes that include the sky always (well nearly always) look better with an interesting sky. While we all love clear blue skies on warm days they generally add little to a landscape picture unless the clearness of the sky is integral to the composition. There is a really interesting relationship between the foreground and background elements in the picture. We can see on the horizon The Wrekin (a dominant feature on the horizon in the area from just about any viewpoint) that nicely breaks-up the level horizon. 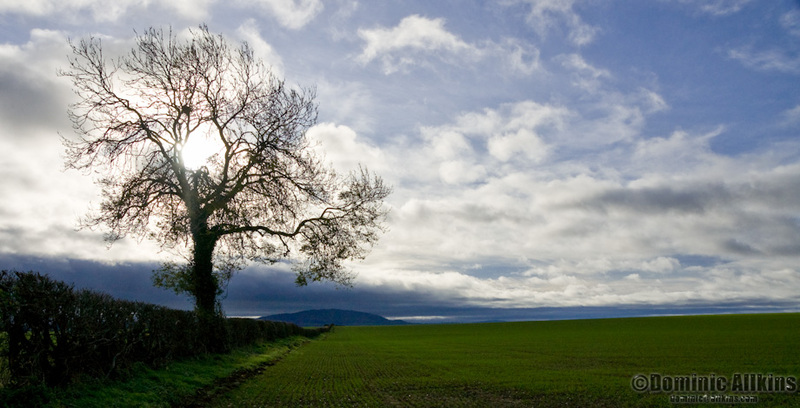 In the foreground we have the lone tree in the hedge-line and the hedge itself provides a perfect ‘lead line’ to The Wrekin in the distance. The sun behind the lone tree adds further drama to the scene – although this does in itself some create some of the problems that need fixing with the image. On closer inspection there were a number of things that needed correcting in post-processing – some that could be corrected pretty quickly and some which needed a little more time and attention. When I posted the original image I had only had about five minutes for some ‘quick and dirty’ post-processing so the result posted was not what it could be. I knew if I spent a bit more time then I could clean up some of the problems more effectively. The best place to start is with an analysis of the original RAW file as it came out of the camera, highlighting the problems that needed fixing. The image below is the original RAW file straight from the camera. Base shot for Shropshire Landscape. It doesn’t take much when we look at the RAW file to see the main problems with this image – not pretty is it. Dynamic Range. With the sun behind the tree (creating a very bright area) it was going to be almost impossible to expose both for the sky and the foreground. It was either a case of getting the exposure right to show foreground detail but ending up with ‘blown out’ highlights in the sky or expose for sky and leave the foreground under-exposed. I chose the latter option – expose for the sky. Why? Two main reasons really; a) Over-exposed skies are almost impossible to recover in post-processing, and b) It’s easier to recover detail from under-exposed areas, although doing so almost inevitably introduces another problem – noise. Chromatic aberrations. What the h**l are Chromatic Aberrations I hear (some of) you ask? The simplest explanation is to show you. 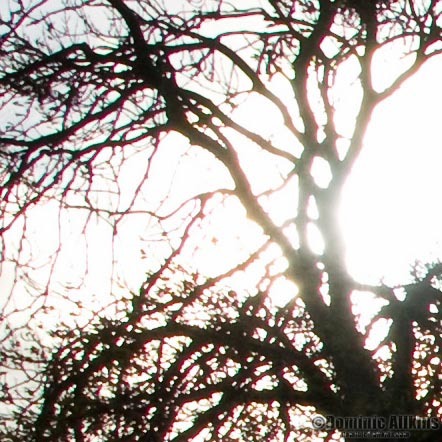 Taking a look at the 100% crop of the tree branches with the sun behind, what do we see? The purple fringing around the branches are the Chromatic Aberrations. Fortunately they can be fixed pretty easily with today’s post-processing software. Initial composition. Obviously the final image is the not the one that was shot – although not far off. I cropped the image to give, in my eyes, a more pleasing composition. Clearly the biggest problem to deal with is the dynamic range, although with a little bit of planning it’s not really that hard to deal with. In an ideal world I wouldn’t have to deal with these problems with post-processing. Landscape photography, like any other type of photography, benefits most from a bit of pre-planning. If I had ‘scoped out’ the scene beforehand I would have known when the sun would be behind the tree and used a graduated neutral density (ND) filter to prevent the sky being blown out while exposing correctly for the foreground. If you read the original post you’ll know that I didn’t have the opportunity to do any pre-planning (I was driving down a country road I use maybe once every other month and just happened upon the scene). Nor did I have that much time either – I had my two daughters with me in the car. They put up with me (most of the time) but I think to have had them sitting around in the car for half-an-hour while I messed around with my tripod and filters trying to get the ‘perfect’ shot would have tried even their patience I think. Parts 2, 3 and 4 will detail how I dealt with the identified problems with this photograph to end up with a picture that I’m really pleased with and, once I’ve got it framed, will hang nicely on my wall. This entry was posted on Saturday, August 14th, 2010 at 08:44 and is filed under Blog, Post processing. You can follow any responses to this entry through the RSS 2.0 feed. You can leave a response, or trackback from your own site.